Everyday your school district experiences challenges, changes, and successes. How do you keep a pulse on everything from teacher engagement scores to what’s influencing student outcomes in one specific school? With Qualtrics, collecting and connecting this data in a single view and sharing it with stakeholders is easy. 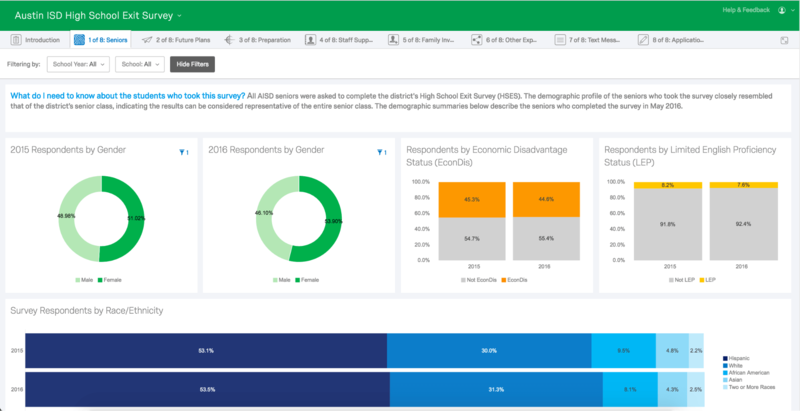 This is 21st century data collection–collect, connect, visualize, and act on data from teachers, students, the community, and the entire organization. School districts around the country use Qualtrics to improve processes–from automating form creation to reducing paper surveys and lowering costs. Qualtrics can also help you simplify compliance by making it easier to collect data from stakeholders and track students from matriculation to graduation. Ready to finally get rid of all those data silos? Use Qualtrics to eliminate disparate data sources, unify data collection and analysis into a single platform, and turn data chaos into a thing of the past. Qualtrics employee engagement and multi-rater assessment solutions will help your district become fully engaged. By actively collecting insights from the voice of your faculty, staff, and students, you’ll be able to identify weaknesses, mitigate negative influences on student success, and develop professional training resources based on the actual needs of your district.